Welcome back Graham! You’ve been missed. 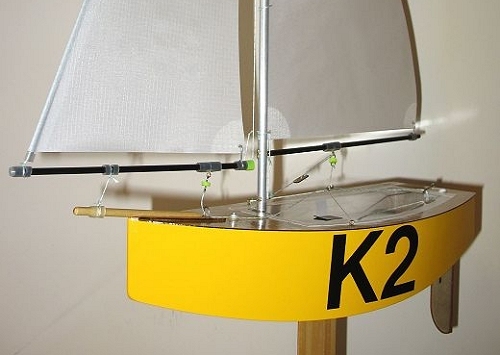 I can again steer folks toward the K2 kit – not only a fun and easy build, but a stable, sweet sailing boat. I’ve added a couple of other Footys to my fleet but neither are as easy to sail as my K2. A couple of friends and I are forming the Pacific Northwest Footy Sailing Club here in Portland and I plan to make my K2 a “Club” boat, as I can’t think of an easier one to introduce newbies to the joys of Footydom! So pleased to see that you are back in business. The K2 that Claudia bought me is nearly finished and have loved every minute of making it – took my time so there weren’t any mistakes and am pleased with finished boat. Don’t know when I will get to sail her but will try to get to one of the U.K. meetings. I found this half footy and thought it a great idea for travel. I think it would make a great kit.